Ever had a great idea about how to design your bathroom, kitchen or living room and then suddenly stopped because you had no one to discuss it further and no idea how to go it alone? The best interior magazines in the world are not going to help you either. What you need is someone by your side to talk things over; learn a little, get some ideas about interior design trends, affordable interior design, interior design styles and interior decorating trends to see what might work for you, your home, family and budget.... from $10! Sometimes the task is big.. sometimes its small.. like what color should I paint my furniture? Finding an Interior Designer isn't always cheap, or easy. Most changes to your home, even minor ones, can cost more than you have to spend. So research is critical. Interior design consultations are like dating before you commit. But these consultations can be expensive and no-one wants to call in an Interior Designer to talk about a few bathroom changes. Hop Skip Decorate is a new site that holds your hand while you work out what you do and don't like from $10. I know it seems cheap, but believe me, it is amazing value. From $10 you can choose someone to help you with your task - no matter how big or small. Are they all Interior Designers? No, some are architects, decorators, 3d illustrators and shopping experts. Are they all in the United States? Most of them are; but some are in Bulgaria, Italy and Germany. The great thing is there is no large outlay, no commitment to their ideas or interior design style either. give your ideas room to grow. move your project along quickly. give you an idea of what you do and don't like. get answers quickly (the turnaround is normally within 72 hours). see what your idea look like on paper. 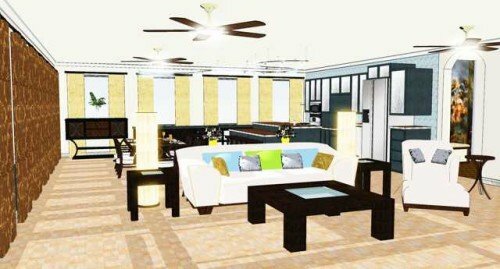 help you experience different designers or decorators. give you interior design on a budget. It's like having your own staff! One of our readers Bev needed help. Here is what Bev had to say about her experience. 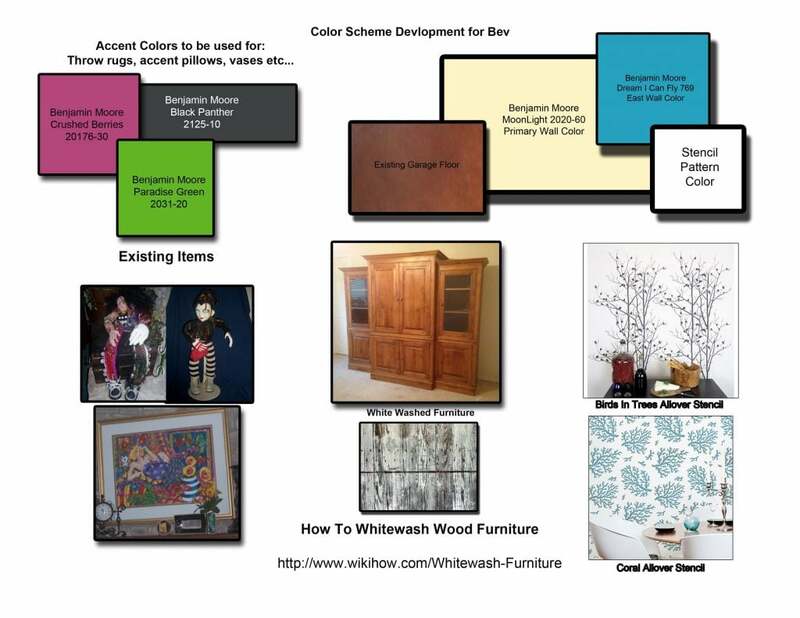 I found this great website HopSkipDecorate where I could get design recommendations from professionals. 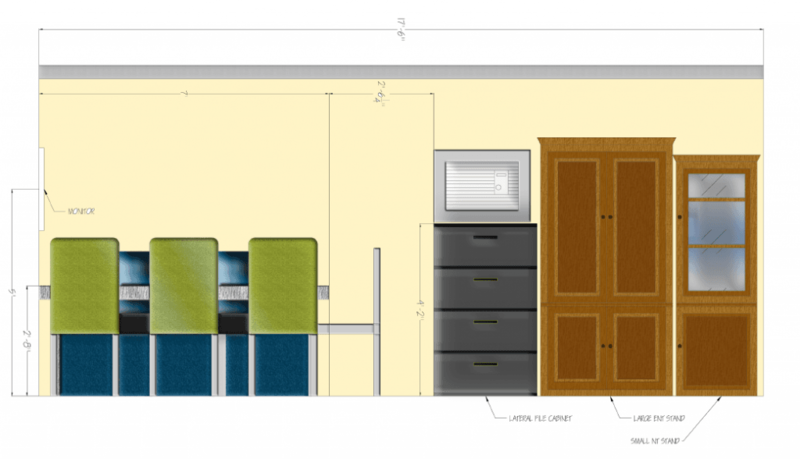 My favorite pro was Shayna who did about four professionally drawn room layouts for me. I had sheetrocked my garage and replaced roll up garage doors with French doors but I didn't know how to use that space. By working with Shayna I was able to focus on the things that were most important and come up with a game plan. My favorite part was...well all of it! I loved talking to Shayna who is very personable, the room layout were very creative and functional, and the colored elevations were the icing on the cake. The price was so affordable that I couldn't resist indulging in more elevations just because I loved seeing the different ways the room can look. My grandson is temporarily sleeping out there and he had a great time going over the room plans and ideas with me. We have moved much of the furniture and finally found a lateral file so I have moved my office files out there which means the current office will become a personal space for him. I can't wait to work with Shayna again when I start putting his room together. I love the whole HopSkipDecorate team. Thank you. And here is what Shayna said about her experience with Bev. My name is Shayna and I offer interior design advice to consumers on a fantastic new website called HopSkipDecorate.com where I recently had the pleasure of assisting a woman named Bev. She initially contacted me because she needed help configuring the layout for a garage that she was converting into a multi-purpose art and office space. She had some ideas about what she wanted, but she said that she would just feel more comfortable to have a second opinion from a professional. She paid for a “jig” which are small jobs that myself and others offer on the website for nominal fees; the most expensive jig is $30. 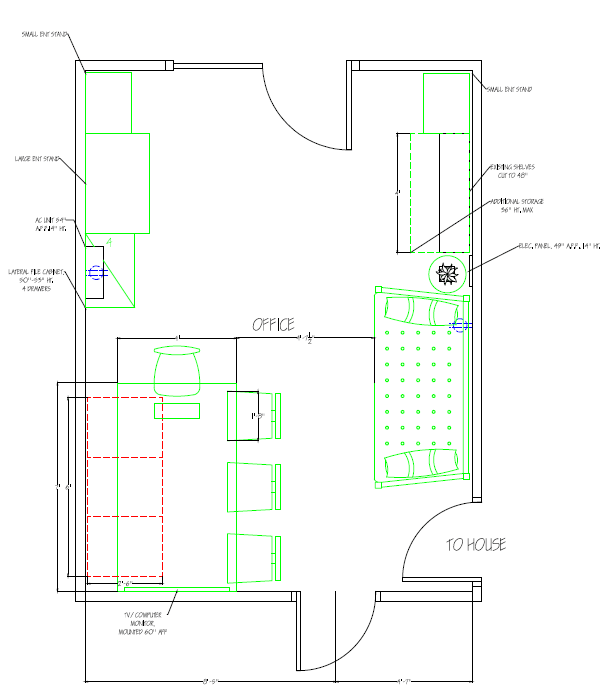 After I drew her floor plan, we discussed a few other options and after a couple of changes, Bev was satisfied with her layout and thanked me. 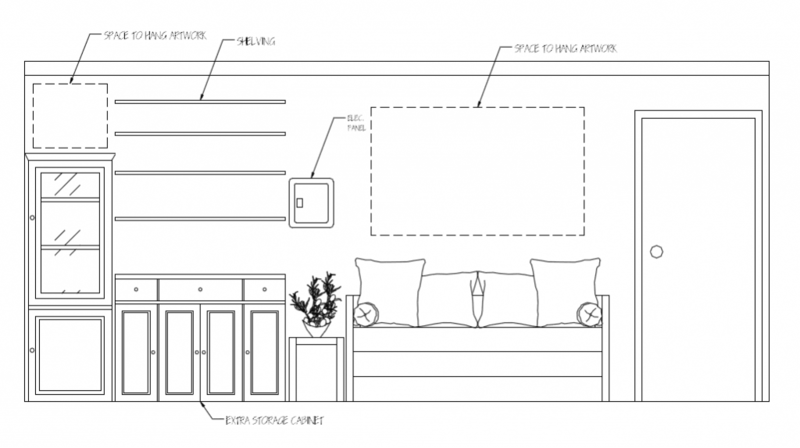 About a week later, I received several more jig requests from Bev because although she loved the floor plan I provided her, she wanted to visualize it before she went furniture shopping and made her final selections for the room. 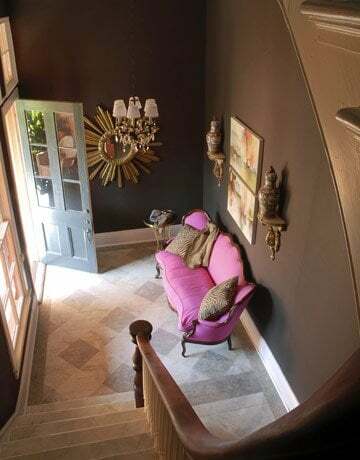 For $50, I prepared a color scheme for her new space and I also created rendered elevations for two of the walls in the new space. As an Interior Design Consultant, I love helping other with design dilemmas. 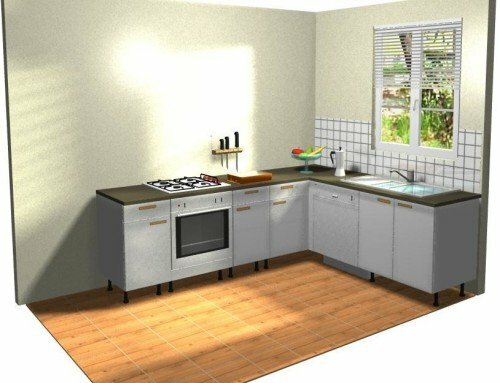 This website makes design services and advice affordable and appeals to the DIY spirit in everyone. In the future, I hope to help others like Bev to realize their vision of their perfect space. Thanks to Shayna and Bev everyone is happy.. But here are the warnings!! The site is still quite new and just like you think $10 is amazing value, getting decorating professionals to sign up hasn't been easy either. How do I know? I did the recruiting. Yes, Hop Skip Decorate is a sister site to Decorated Life. When I realized I needed this kind of service myself, it didn't take long for the penny to drop that other people probably need it to. No matter how good your eye is, or your taste or your DIY decorating skills, sometimes its great to get a third party to help out. And because its all online, your request goes out to the universe, to some other location and the answer comes back sometime later. If you want to know more - you can contact me or head over to Hop Skip Decorate and see if anything interests you! Would you like to sign up and offer your services? Just go to the site, create an account and put in your jig details, with photos and a price for the job and you are on your way. I will help you however I can to get the word out about your services.